Because it’s not exactly social media that’s ruining your life, but rather, your relationship with it and the ways in which you consume it. I was in denial for the longest about how much time I spent on social media, how often I checked it, and my emotional stability around it. It wasn’t until I took a 7-day social media detox, that I came to these conclusions. If you’re a content creator, blogger, or entrepreneur, this is especially applicable to you. How easy is it to wake up every morning and scroll your social media feeds before ever lifting a finger to your art, work, or things that bring you joy? When you create content before you consume it, you allow your brain to unleash its inner-genius with the freedom to flow in any direction it wants, without getting trapped in the comparison game of everything around you. This was the hardest thing to comes to terms with. Every morning immediately after waking up, I rolled over and made sure that all my messages, comments, emails, and DMs were answered before anything else. Being 6-12 hours ahead of most of my friends, clients, and sponsors meant that during my slumber, I missed a lot of communication. Sometimes this took a few minutes — but more often than not, a few hours. Next thing you know, my 6AM wake up and ambition for the day is drained by 8:45 because I’ve now carried and took on the weight of others people’s questions and needs before my own. Don’t get me wrong, I absolutely love being a resource and friend to so many. But my best, most precious, and vital hours of every day needed to be invested in myself before anyone else. So I got back into my morning routine of meditating (I use Simple Habit and Insight Timer — 5 minutes guided on Simple Habit, and 10 minutes of ocean waves on Insight Timer), journaling, Bible devotionals, podcasting, reading, and THEN opening my laptop or looking at my phone’s messages to see how I can be of service to others. In order to truly serve others the way I know I’m capable of, I need to first be serving myself. I love people’s enthusiasm for my destinations, but I could go without hearing how the most obvious attractions need to be my first stop. It’s why I no longer post in real-time. So that I can do all the things that I truly want to do and see, without the cringe-worthy and unsolicited advice of others, and then post when I’ve gotten MY checklist out the way. The way I travel has evolved from my $10/day budget that I started on, and I love to engage with cultures in a way that feels right to me at the time. Sometimes that’s through their cuisine, other times through their nightlife. It just depends on how I feel. I don’t over-curate my itinerary when I’m not on a destination marketing campaign, so whether I’m watching the sunset on a hill or having champagne from a rooftop bar, I spend my time in countries in different ways. But I don’t think one way is better than another. How many people and accounts do you follow that are literally just noise to your virtual ears? But if you see and hear it enough, it has the ability to silence the things most important to you. There’s nothing worse than giving power to irrelevant people. My new favorite hobby is drawing boundaries, and my ideal first date would be to draw them together over wine. I digress. But I’ve joked in the past about how I will get a Facebook comment about a DM, about an email, about an Instagram photo, and I just, no. Guys, no. I love you. I really do. But this is NOT the way to engage with people on the Internet — especially ones you’ve never met in real life. It’s also my fault for not drawing and setting those boundaries early on, because when you become so accessible, you again, relinquish control of your time and start giving more of it to others, and to your detriment. How many times have we seen people on dates, at attractions, or just in everyday life, experiencing something incredible before their eyes, but they rather be living in an alternate reality via whatever they’re experiencing through their screen. It’s as if we’re on this never-ending search for more. More excitement. More euphoria. More ecstasy. Because what we currently have is seemingly never enough. A lesson on gratitude another day. How guilty are we of comparing our behind-the-scenes life to everyone else’s highlight reels? It’s why I’m so excited to publish posts like My 10 Worst Travel Moments every year to remind you guys that nothing, I mean NOTHING anybody posts is 100% their real life. Including my own (as I write this looking like I got hit by a bus and just a missed shower away from crackhead status). As a content creator, I’m constantly drawing a line between what I feel is authentic to my voice, and what is professional from a business and brand perspective. It’s something I feel passionately about, and will continue to improve as I evolve in this industry. The amount of emotional energy we give to people that don’t matter is astonishing. How many people come across your feeds that sicken you? Alas, you continue to follow for the gossip, juice, and ability to get a front row seat to the train-wreck of their lives. Join me today and go on a virtual purge and just unfollow and mute the accounts of people whose content doesn’t serve to educate, empower, or inspire you in any way. It’s not personal, it’s necessary. Continuing to hate stalk someone is like drinking poison and expecting THEM to die from it. Your logic is flawed. Free yourself. When we’re constantly shown things we should have, places we should be, and emotions we should feel from all directions, it’s so easy to feel inadequate. All of a sudden the book you just wrote doesn’t feel like an accomplishment because someone else on your feed is a New York Times Best-Seller and you’re, well… not. We’re all running in different lanes, yet we try to side-step and get into someone else’s when their possessions and prizes look shinier than ours — meanwhile, they just paid $10,000 to get their “prize” to look golden and shimmery. Catch my drift. The amount of content creators I’ve met who are utter douchebags and divas is too many to count. Why? Because they believe their online following equates to real-life celebrity status. They expect people to bow down to them, yield to their every word, and praise the ground they walk on. My dear friend Lola wrote a great piece a few years ago about the danger of believing your own press (it’s seriously one of the most well-written pieces of the decade, and something I read at least quarterly). Are we only going where we’re celebrated, or do we allow others who can challenge and evolve us to be locked out of our virtual lives because they’re not praising us the way we’ve been accustomed to hearing on our journey to the top? I challenge you to uninstall your social media apps for a few days, even weeks if you’re really up for the detox, and see how much more freeing of a life is on the other side. After 17 years of blogging, 6 years professionally, I had to come to terms with the fact that it’d be foolish and unsustainable to just give up social media cold turkey for months, like I’ve been recently inspired to do. So in the meantime, I’ll leave my apps uninstalled and log on via desktop when I absolutely must — no longer digesting it unnecessarily to pass time. I’ll post and share updates when I’m called to, not because there’s a need to keep my engagement soaring and beat the algorithms (by the way, this word makes me itch — let’s kill the need to blame every waking flaw or failure about our social media strategies on the almighty A). And instead, I’ll be blogging more regularly. At least a lot more regularly than last year. Something I admittedly got away from when my brand collaborations on social media and blog’s passive ad revenue was enough to meet my financial needs. No more of that. Getting back to what brings me joy. And that’s writing. Connecting. Challenging. Reflecting. And diving deeper into the everyday idiosyncrasies of human behavior. Though social media has arguably been the most transformative tool of our time, it’s subsequently the most damaging as well. 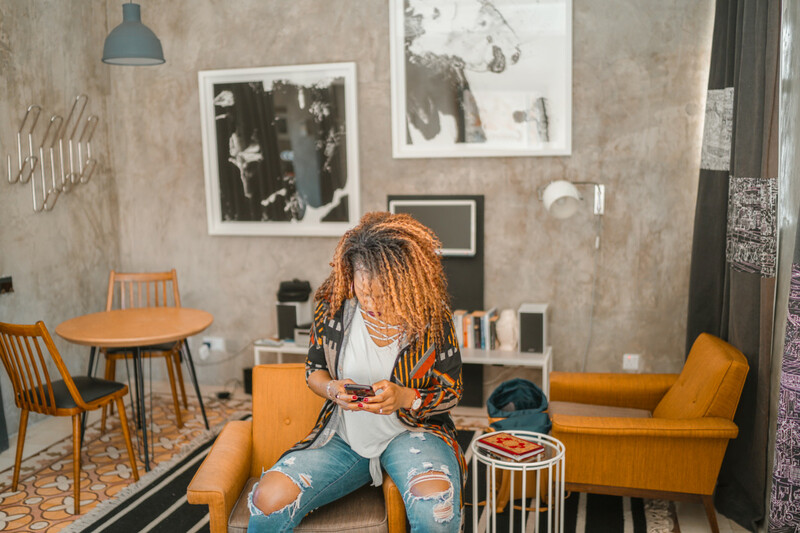 But I hope this blog post gives you the ability to reflect on your own relationship with social media as you take ownership of your emotions to improve your overall mental health. Thanks so much for reading and feel free to share the article, as well as your thoughts below.